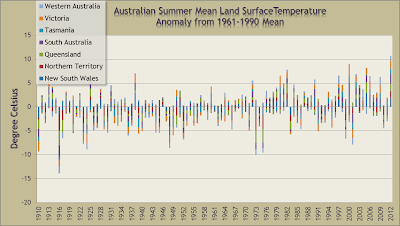 It is very odd how many science deniers from Australia and the USA keep trying to deny the fact that last summer was the hottest on record for Australia. This is despite all the evidence such as the dreadful infernos across most states, but particularly in Tasmania and NSW; and the searing heatwave across the continent in the first half of January. 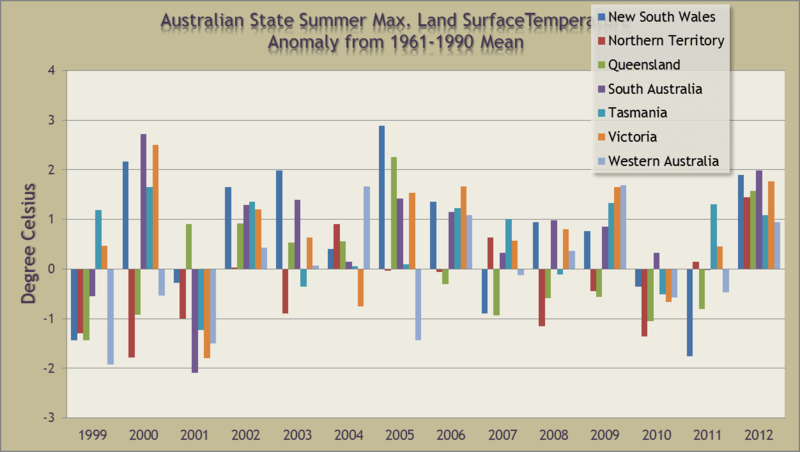 How could it be the hottest summer for Australia when it wasn't the hottest summer for any one state? 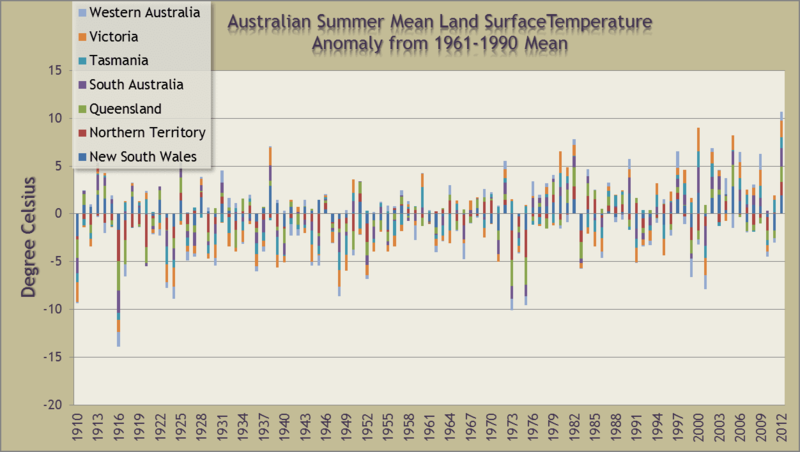 I've come across a couple of people who are wondering how can this past summer have been a record hot summer for Australia given that it was not a record hot summer for any state or territory. Here is why that can be. This first chart shows the summer maximum temperatures for states and territories going back to 1999. Click to enlarge. You can see that most years when some states were hot, others were cooler, even below the mean. 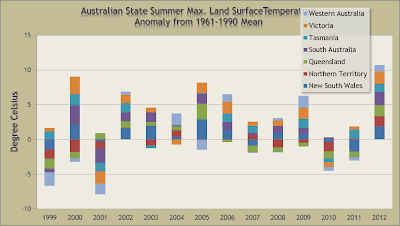 In 2012-13 on the other hand, it was hot everywhere at the same time. The columns are all clumped up together. So even though every state and territory had at one time a hotter summer, at no time have all states and territories been this hot all in the one summer. 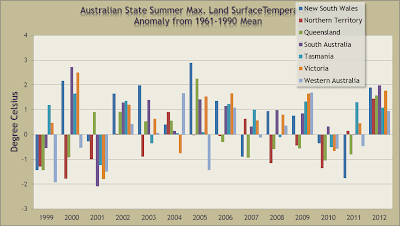 You may have noticed that Australia has had cooler summers, particularly in 1999, 2001 and 2010. To get some perspective on that, go back to the top chart, which goes back to 1910. Here is a stacked chart of the States and Territories for the same time span. I don't think we'll see a summer as cold as 1916 again, and probably not even one as cold as 1973 or 1975. The same proviso applies to this stacked chart. It doesn't translate to the Australia-wide chart because the area of each state and territory differs. It is purely for illustrative purposes. If after that you are still not clear on how could it be the hottest summer for Australia when it wasn't the hottest summer for any one state, try this for yourself. It's a matter of simple arithmetic. Here's a series of numbers to illustrate. It is sets of numbers grouped by year. In all but the last two years, at least one of A, B, C, D or E has the maximum for all years. Each one has a "record" highlighted. Yet the average for Year 5 is greater than the average in any prior year even though none of A through E has a record in Year 5. June 29, 2013 at 3:56 am Hottest summer or not, the facts are that not a single state recorded their hottest. June 29, 2013 at 10:28 am BTW how many state heat records were broken during the “angry” summer? Oh none! Which is funny coming from someone who doesn't know a baseline from a waist line. Apparently just tying a previous record (115 or 117 depending on which station) is no biggie since the record was set before. He really is a super genius. I've just read it. Very odd reaction from Anthony to a 46++ degree day. Maybe his mind is really going. I hope for his sake he doesn't go for his daily jog around the park in that sort of heat, given that he thinks that it's "fairly unremarkable". Considering that it is 7pm and 102F right now in his hometown, you're probably right. I live in Bozeman, MT and it is usually in the low to mid 70s here at this time of year. We are running about 15F to 20F above normal right now. By any stretch of the imagination it is freakin' hot here (and A/C is rare here because it just doesn't get that hot. Heating on the other hand is heavily used in a different season...). But he must minimize any high temps. If the temperature had been 116 (or 118) he would have said that it's not unusual because it only broke the old record by a degree! Yes, for some folks this is counter-intuitive. Actually a circumstance which makes this more likely, is that the smaller a territory, the greater the variance of natural variability is, and the less likely the current upswing will "stand out" against this background. You will remember that 1934 remained the warmest U.S. year long after globally, more recent years beat it solidly. Maybe Tony wants to the record broken by 15 degress F, which occurred Saturday in Kugluktuk, NU Canada. It reached 91.5 F, which is an incredible 44F above normal. He'll dismiss such a record by stating that the station was near an airco exhaust or something (um, airco exhaust? What they need airco's for there? Aha).